Emmanuel Iduma is a young writer of immense imagination. He is “one of the most challenging voices in Nigerian literary scene” as described by Onyeka Nwelue, author of The Abyssinian Boy. 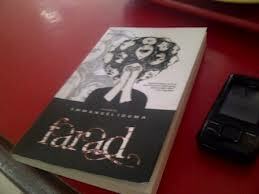 Iduma’s debut novel, Farad, has been compared to Jose Saramago’s work for the lucidity of its prose and experimentation in form. Here is an excerpt of Farad by Emmanuel iduma. SHE WAS GONE BEFORE I REMEMBERED. Her voice had sounded like the pouring of water into an empty cup; her eyes had seemed as though they could see things yet to be. Her life had always seemed to be on the verge of happening. She used to talk of doing something. Even when my elder brother was alive, and laughter bounced about within the walls of our house, and music was an early morning gift. There was a mahogany plank fixed to the front door of my brother’s house. On it he had inscribed, “Because it is mine” underneath the words “Peace Villa,” the name of the house. The letters seemed to have been painstakingly engraved, such that they seemed buried deep in the wood. Even before he had died, she had spoken of changing those words to “Because it is ours.” She was my brother’s wife, see. My brother shook his head and looked at her in a way that spoke of her longstanding madness. Her eyes met mine, and I bowed my head. My brother died the next day in a big fight. He was a car dealer. His was, by all standards, the biggest car shop in Jos. The fight had started two shops before his warehouse. It went the way all big fights go. His shop was burnt. He went with his shop. Her crying was the least pronounced. Our neighbours shed more tears than she did. They spoke to me in her stead. But even in my brother’s days, they would have talked to him to talk to her—even if she sat with them in the parlour. When a group of Igbo men came to commiserate, they considered me old enough and talked to me while she sat with us. If you had not known, you’d have thought she was an apparition sitting in the parlour while we mourned. I could have said I didn’t think museums were started, or that it was an inappropriate thought given the circumstances. But instead I said, “Yes.” And when she nodded, smiled, and rubbed my shoulder, I said, “Yes,” again. I did not join them in the protest. I heard that only ten men had shown up, and that they had called it off when no one else joined them. Yes, she had confronted my brother about the words he had inscribed on the plank. Incidentally, it had been the day just after I had come from our parents—they had insisted I go to my brother, so he could ‘speak some sense into my head’, for my decision not to go to university. She talked about the phrase in a manner that showed she had spoken about it before. She pursed her lips and looked upwards then shook her head. She walked away from him. I wondered why she spoke of the words on the plank—I thought she shouldn’t be bothered about such little things. She was the kind of person that was bothered about small things. I walked away from her. She spoke of my brother as though he had had no mind of his own. While she slept, I took down all the photographs—all twenty three of them, despite the way the hallway glowed like silver. I carried them outside the house. I took a stone and broke each of the photographs into bits. In the morning when I woke, she was gone. There was a white sheet of paper on the table in my room. She had started to write something, but cancelled it. I could see where the pen had torn the paper while she scratched off the words she’d written. The Igbo Community in Jos told me they were going to stage a protest against the manner of her death. I told them it was unnecessary. Their spokesman, a Reverend Father who kept dreadlocks asked me why. I told him I was going back to my parents in Ibadan. That was all. “Because you were ours.” Then I told him no. He should have them inscribe “Museum of Silver Lights” instead. He frowned. I told him to call off the epitaph idea entirely. On the day she was buried, someone came with a handwritten invitation he claimed she had given him. It read, “Please attend the opening of the Museum of Silver Lights.” And our address was written on it. They said she had been hit by a car while distributing her handwritten invitations. I often dreamt of an empty room with light bulbs covering its ceiling. In my dreams, I watched the lit room from a distance, usually unable to go in. Sometimes this dream happened when I was awake. I knew then that it was fixed in my memory; I knew my dreams by heart. I had come to that point when I was the one who determined what I dreamt about, what I made-believe. And this capacity, this ability to stretch myself to such lengths, did not come by chance. When my sister-in-law died, in the process of distributing invitations to her Museum of Silver Lights, my parents came to Jos and took me away. They had decided for me. I was going to Ife; I was going to study law. There are times when I assume I was beguiled, brain-washed. In my earlier stubbornness, I had not conceived that my parents’ could prevail over me. Yet, in a matter of time, it became my own wish to study Law in Ife; I made my dream. There were so many things that had happened – my brother and his wife, their deaths – that perhaps my grasp on what was real and what was not, the dividing line between both, had become blurred. In circumstances of this kind, you would ask yourself whether you were certain of what was and what wasn’t—and when you thought you had found the answer, the question would present itself to you again. There were other reasons why I chose to attend the Chapel, aside from the fact that a classmate whom I admired had invited me. She was a girl I thought I loved, until I told her and she said we would spoil things if she accepted. So, even though she stopped attending the Chapel, and I began to see her with another boy in another Church on campus, I kept attending the Chapel. There was something about the size of the compound that intimidated me, made me believe that I couldn’t understand its complexity even if I tried. The hall could probably sit about five thousand, and; illusorily, less than five hundred were regular members. I joined the Youth Fellowship as soon as I made the resolve to be a member. On my first Sunday, Tutu – that was her name – had given me a copy of Seeds, a monthly publication by the Youth Fellowship. Then, in my first year, I had decided that I wanted to write poetry. Seeing that Seeds had no poetry, I considered joining the Editorial Team so that I could contribute some. I asked Tutu to introduce me to the Editor. His name was Jackson, he was in his final year, and was bored; editing Seeds had become humdrum. In another two years, by my third year, I had become the Editor of Seeds. Oko Egwu wrote for Seeds occasionally. He told me, after a Youth Fellowship meeting, that he wanted to write a short piece about the Choir, or that it would be better if I wrote it. I told him it was going to be difficult, seeing as we had a short time, a little over a week, before the next issue would be released. He told me why he wanted me to write it. I shook my head, understanding the import of what he was asking. “We’re really inconsequential, here,” I told him. Before he left Ife, Jackson had introduced me to a friend of his, a medical student. He said that his friend was a good poet, the best he knew, and that while poetry bored him, his was an exception. Jackson said he had always been unable to get his friend’s poetry into Seeds, and that I could try, that I could succeed. So he introduced me to his friend, a certain Damilola Ajayi. I asked Damilola for his poems on the evening when Oko Egwu spoke of writing about the choir, and he searched in the bag he was carrying for something he had scribbled that morning. But it’s a story nonetheless. Oko’s objective was to get the young people in the choir, which he happened to head, to agree with the Assistant Choirmaster’s proposition to hold an election during the forthcoming retreat. Seeds was due to come out two Sundays before the retreat. I told him he was relying on a fluke, that not many people took our work in Seeds seriously. He looked at me. I understood his concerns. It was surprising even to me that I edited Seeds but did not believe in my work. It was surprising that my life seemed to comprise of things I didn’t believe utterly in—commonplace, lacklustre, elements gave form to my life. Despite having accepted to write about the Choir, I did not trust myself, or my writing—Damilola had once told me a writer’s life was a hybrid of moments of intense doubt and moments of stellar brilliance. I called Oko when Seeds arrived. There was a fight in my head even before he said he wasn’t sure we could distribute it. It was the first time he read what I wrote—our schedule had been tight. I smiled and asked him why. I knew he was afraid but I asked myself if I was any different. We sat in a small room that served as an office for the Youth Fellowship, filled with musical instruments, a computer, a small collection of Christian literature and undistributed past editions of Seeds. I had called him because I had wanted him to see what I had written. And he had worsened what I felt by saying what he had said. “Are you ready for what will happen?” He asked. He retorted, sharply, “It matters.” But that was all he said; he looked crestfallen, a look that showed he was leaving things unsaid. He walked out. I wanted to call him back, talk to him, and convince him that I was not as scared as he was. But I could only see his hunched shoulders, the way his body seemed to sag when we talked, and I knew mine wasn’t different. It was sagging and unsure. There was man in the Chapel, Dr. Addo, who always sat in the first pew. He was considered eccentric and unreasonable, but he had a Ph.D. in Electrical Engineering and lectured in the same department. His students said he cursed in class, called the Yoruba gods of thunder and lightning on all those who taught them that it was unnecessary to memorize whole textbooks or substantial parts of his lecture notes. But in the Chapel, during the sermon, mostly, he raised his hand in agreement, asserting himself in a way that made me think he was putting an end to doubts of his irrelevance. I saw him walk up to the Choirmaster just after the Church service had ended. He walked as though on fire, casting his legs in front of him with absolute certainty. The Chapel was still filled with members who were chatting amongst themselves, making small talk before leaving. I stood behind, some yards from the Choirmaster, talking with Charity, Tutu’s friend, who had remained committed to the Chapel. We heard Dr Addo saying, “Did you see this?” over and over to the Choirmaster. The Choirmaster was surrounded by Choristers, who had assembled after the Recession. Then Dr. Addo stopped asking the question, and began to tear Seeds into shreds, bit by bit, littering the Chapel. There was now a substantial number of Choristers standing by as he tore up Seeds. Some members of the Chapel walked to where he stood. Two minutes later, I heard Dr. Addo say, “Where is that Christian Ike? Does anyone know him?” A part of me wanted to walk to him, and surrender myself to any consequence they were going to mete out. But I considered that foolhardy. I walked quietly out of the chapel, hoping that someone saw how I escaped from the limelight, or whatever it was that could have happened if I had spoken to Dr. Addo. As I walked away from the Chapel, I tried to think about whether it would be trite to put that issue of Seeds in a glass, and hang it in my room in school. Perhaps it would be better to take it home, where there were reminders of the life I had lived in Jos—the life my brother’s wife had lived, the lights she had seen, her botched Museum of Silver Lights. As I walked, I wondered what Oko was thinking, if he had got what he wanted, if he had not given himself the excuse that he did not know what he wanted. I imagined there were young people who would have been stirred by what I wrote, and I imagined there were those who wouldn’t have cared, for whom the Choir had no need for change. And there might be those in-between for whom nothing was right or wrong—for whom all that was necessary was the continued functioning of the Choir, irrespective of what I wrote, or did not write. I heard my name being called. I stopped, and saw that it was Oko. He was panting from running, but he was smiling. I wanted to ask him why he was smiling, but I can only imagine that he had dreamt my dream, of an empty room, whose ceiling was covered with light bulbs, waiting for us to enter, awakened, dreaming no more.